The White Gull Inn has been managed by the Coulson’s for nearly 50 years. Some things get old, while others get better with time. There’s no doubt about the category in which Fish Creek’s jewel, the White Gull Inn, belongs. At age 122, it still reigns at the end of Main Street, as it has since 1896. Inside, the cozy warmth of the early American décor continues to charm diners and houseguests. When Herman Welcker of Milwaukee brought his family to vacation in Fish Creek in the mid-1890s, he found a bustling village whose primary business was shifting from fishing to summer tourism. The only housing for those visitors was a boarding house owned by Asa Thorp, the village founder. Like many tourists today, Welcker decided to stay in Door County permanently. He built what is now the White Gull Inn, named it The Henriette for his wife, surrounded it with cottages and acquired more land for a dock and a farm that produced food for the inn. 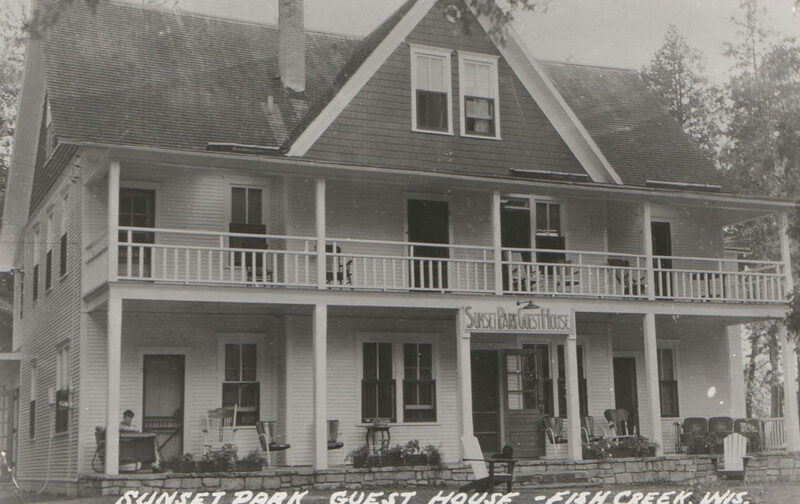 During the 1950s and ’60s, many of Door County’s historic inns were torn down or “remuddled” beyond recognition. The Henriette, even while going through several ownership and name changes, escaped that fate when Andy and Elsie Redmann purchased it in 1959. 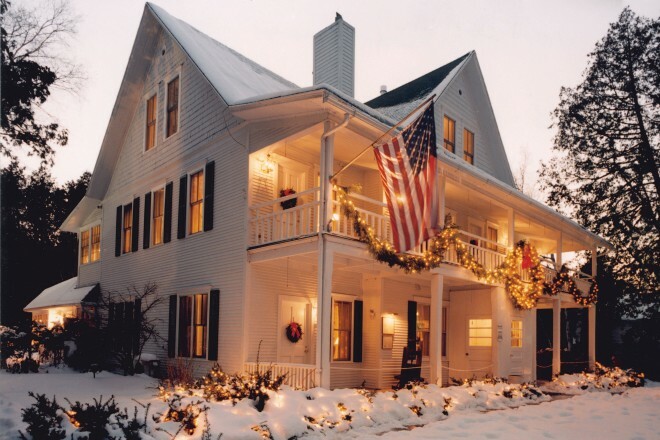 They renamed it the White Gull Inn; created a warm, early American look; and started a fish boil on a flagstone patio under century-old maple trees. Andy and Jan Coulson met through the White Gull Inn. Photo by Len Villano. And then, in April 1972, Andy Coulson – a Milwaukee native two years out of the University of Wisconsin-Madison and working in Australia – received a telegram from his college roommate. The new owners found they’d purchased a badly deteriorated inn. But they’d also inherited a tremendously popular fish boil and the expertise of Russ Ostrand, the inn’s longtime master boiler, who not only cooked the fish, but then played his accordion to entertain diners as they ate at outdoor tables. Coulson sometimes accompanied Ostrand on his five-string banjo. While the young owners worked feverishly for a month to get the inn ready to reopen, a young Green Bay woman just out of high school pressed her nose against one of the dusty windows. She had come to Fish Creek to find a job, loved the place and wished she could work there. “The best business decision I ever made as general manager,” Coulson said, “was hiring Jan Lindsley.” And Jan added, “Choose your first job out of school carefully. It could be your last.” She started work as a housekeeper when the White Gull Inn reopened in June 1972, making $1.25 an hour and paying $60 per month for a tiny room that she shared with three other young women. As the inn was being restored bit by bit, Jan worked in nearly every position available. In 1975, after the kitchen had been remodeled and the owners were preparing at last to open the dining room for breakfast, the cook Andy had hired took another job at the last minute. Jan became the head cook. “And that’s when Andy asked me to marry him,” she said with a laugh. “I’m the longest-running employee.” On Nov. 1, 2018, they celebrated their 48th anniversary. While in Australia in May of 1972, Andy Coulson received a fortuitous telegram. “White Gull Inn for sale. Need partner with $3,000. Please advise,” read the wire from his college roommate Dan Noonan. 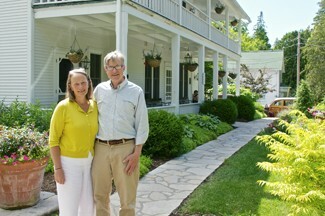 Coulson signed on as the fifth partner and returned to Door County in time to open the inn by Memorial Day. 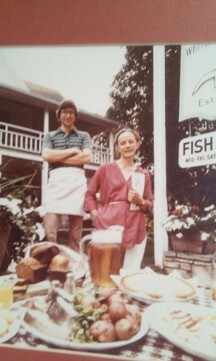 Jan (Lindsley) Coulson graduated from high school that same spring and found herself working at the White Gull Inn. Photo by Len Villano. The Coulsons bought out the other partners in 1981 and began years of intensive work, creating an exquisitely restored interior inside a charming, old shell. They also acquired two houses for their staff and two more rental properties, including the historic Lundberg House, built in 1895 by Fish Creek’s first grocer. Today the White Gull Inn – which long ago earned its place on the State and National Registers of Historic Places – has become a favored dining and bed-and-breakfast spot for generations of locals and tourists. The property, open year-round, includes 13 two-person rooms and four cottages that accommodate from two to eight. Every room has been meticulously restored, maintained and decorated with antiques, coordinating prints and fabrics that retain the warm, turn-of-the-20th-century flavor. Amenities are strictly up to date, and a full breakfast is included in the room rate. Monthly house concerts during the winter feature contemporary and traditional folk artists from all over the country, and an optional, candlelight dinner precedes each 8 pm concert. All meals are open to the public. Reservations are recommended for dinner. The fish boil, in continuous operation since the 1950s, is offered three times per night, four nights a week during the summer and on Friday nights throughout the winter. Although each dinner seating accommodates 80, these fish boils are so popular that reservations must be made well in advance. Meredith Coulson-Kanter, the oldest of Jan and Andy’s three daughters, said fish boils often serve as rehearsal dinners for brides and grooms for whom White Gull Inn vacations are treasured memories. The meal includes whitefish, baby red potatoes, homemade Swedish limpa bread, sweet breads, cherry pie and ice cream – but never onions. There have been at least six master boilers since Ostrand, but the White Gull Inn still honors his conviction that onions spoil the flavor of the other items. And then there is the famous cherry-stuffed French toast. In 2010, Andy was bussing tables when he received a call from a staffer at ABC’s Good Morning America (GMA) TV show in New York, asking if he was aware that the White Gull Inn was one of four finalists in its Best Breakfast in America contest. Andy didn’t even know there was a contest, but he discovered that, indeed, the inn’s cherry-stuffed French toast was competing with waffles and wings in Houston; huevos rancheros in West Asheville, North Carolina; and king cakes in Portsmouth, New Hampshire – all much larger TV markets. The White Gull Inn during a previous incarnation. Submitted. 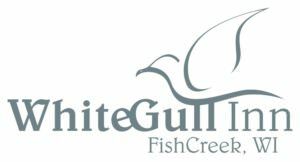 There are other places in Door County with beautiful rooms and memorable food, but what makes the White Gull Inn distinctive is the relationships it has built with its many guests. 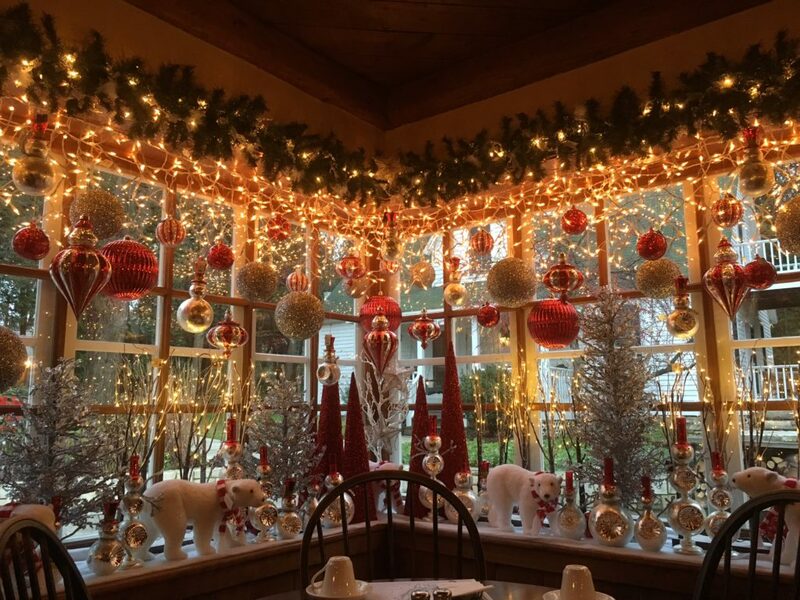 The Christmas corner table at the White Gull Inn. Submitted. Meredith Coulson-Kanter worked as a veterinarian in New England and Madison before completing a three-year master’s program in sustainable agriculture and food systems at UW-Madison, where she met Chris Kanter. At a time when she was thinking about returning to the White Gull Inn, her parents were thinking of retiring. She started training as the kitchen manager as soon as she finished her graduate degree in the summer of 2014. She and Kanter married three years later, and on May 17, 2018, they purchased the inn from her parents. Does Coulson-Kanter anticipate any changes?